more advanced than Andre-Jacques Garnerin's! Yesterday a Google Doodle commemorated the first parachute jump 216 years ago by Andre-Jacques Garnerin. 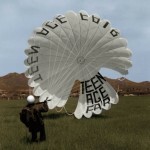 This is a great opportunity to give a nod to pioneers in parachuting and also to expand the general public's knowledge of this historic event in 1797. As you probably know, Google Doodles are created to celebrate some important event or for the celebration of an achievement. The doodles which are often interactive add an element of fun and thrill to the otherwise colorfully static Google logo. In an article in the India Times technology column, Andre-Jacques Garnerin is given credit for inventing the frameless parachute. He deployed his umbrella-shaped prototype, which was 7 meters across, at Parc Monceau, in Paris, France on October 22, 1797. Read more about it HERE; hope you enjoy the interesting details in this write-up. Don't let the visuals of a parachute with an attached basket fool you! This is all about parachuting. If you happened to miss the Google Doodle yesterday, you can see it in full motion, color and sound HERE on YouTube. This entry was posted on Wednesday, October 23rd, 2013 at 1:22 pm	and is filed under Uncategorized. You can follow any responses to this entry through the RSS 2.0 feed. You can leave a response, or trackback from your own site.